Marguerite’s birth was the result of an alliance that was to shape European history for a hundred and fifty years. Her mother, Mary of Burgundy, was sometimes called ‘Mary the Rich’, reflecting her status as the most eligible heiress in Europe in 1477. 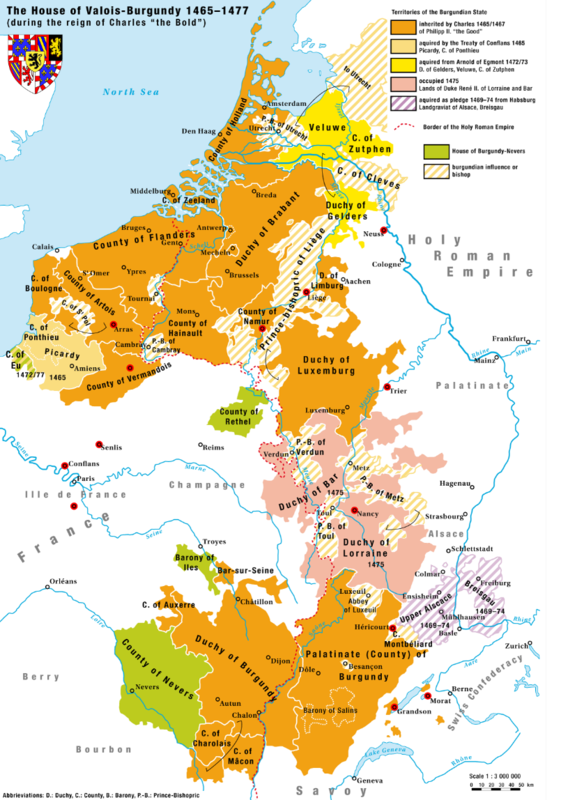 Mary stood to inherit the agglomeration of states (never very clearly defined but approximating to seventeen provinces) known variously as Burgundy, the Low Countries or the Netherlands during the fifteenth and sixteenth centuries. This polity of Burgundy had come together during the period 1363 – 1441 through a mixture of inheritance, marriage, purchase and war. Geographically, it was not just the area we think of today as the Netherlands but also modern Belgium, Luxembourg, and parts of both modern France and Germany. In feudal terms, the dukes of Burgundy were vassals of the French crown for certain provinces, and of the Holy Roman Empire for others. The inhabitants spoke Flemish, French and German in different parts of the state, and followed local law codes – some sources suggest there were as many as 700 different codes in operation. The rulers of Burgundy were immensely wealthy – the areas in the modern Netherlands were the first to urbanise intensively, and to develop an export trade. It is estimated (Gunn et al) that by 1500, around 18.5% of the Burgundian population lived in towns or cities with populations greater than 10,000, compared with a mere 3.1% in England and Wales. They also show that economically, Burgundian commerce was worth five times as much per head as English or French in 1500. The Burgundian dukes tried to meld their disparate territories into a unified kingdom – the Holy Roman Emperor, Frederick III, resisted the pleas of Charles the Bold of Burgundy (1433-1477) to grant him the status of a king, but, notwithstanding imperial reluctance, Charles took on sovereign powers within his territories, and by the 1470s a States General (parliamentary body) had been instituted in an attempt to bring the various provinces together, and, most importantly, agree taxation. Despite his three marriages, Charles the Bold had only one living child, Mary, and throughout the 1470s there was significant competition for her hand – including from George, Duke of Clarence, brother of Edward IV of England. Charles’ unsuccessful siege of the Imperial city of Neuss was terminated in a treaty that obliged him to grant Mary’s hand to Maximilian of Hapsburg, son of the Holy Roman Emperor Frederick III. The marriage between Mary and Maximilian was not completed immediately, and, on Charles’ death, there was intervention from France whose king, Louis XI, hoped to retake many of Mary’s territories by refusing to recognise female succession in French vassal states, which included the duchy of Burgundy (but not the county), Artois and Picardy. To enable her succession, Mary was obliged to make various concessions to her different provinces, who took the opportunity to wrest back some of their power from her father’s policy of centralisation. She then finally concluded the match with Maximilian on 19th August 1477, at Ghent. Maximilian was named as co-ruler with Mary, and the couple spent most of their time in her territories, with his military contribution to their joint enterprise limiting losses to France. The couple had two children, Philip, known as the ‘handsome’, and Marguerite, probably named for Mary’s step-mother, Margaret of York, who was godmother. Maximilian’s home territories were in Austria, and, like all children of the house of Hapsburg, Marguerite had the title of Archduchess of Austria. When Marguerite was two, Mary died from internal injuries sustained in a hunting accident, naming Maximilian as regent for her son. Many of the Burgundian nobles had reservations about being subject to the rule of the Emperor’s son, and likely heir (the empire was, in theory, an elective monarchy). Both Marguerite and Philip were in the castle of Ten Waele at the time of their mother’s death, and the burghers of Ghent refused to hand them over to their father, instead promoting a regency council. Louis XI scented an opportunity to challenge Maximilian again, and also refused to recognise him as regent, whilst offering sweeteners to the provinces that wished to make peace with him. In 1482, with internal divisions over the future of his son’s territories intensifying, Maximilian was forced to come to terms with France in the Treaty of Arras. Under it, Marguerite was betrothed to Louis’ son, the Dauphin Charles. Her dowry was to be the disputed territories of Artois, the county of Burgundy (otherwise known as Franche-Comté, and separate from its neighbouring duchy of Burgundy) Macon, Salins, Bar-sur-Seine and Noyers.